These days, maintenance and service are vital for retaining the value of your motoryacht. You can usually perform the annual maintenance on your boat yourself in your home port or at one of the Linssen Service points. However, Linssen Yachts’ service goes a step further. There probably comes a time when your boat requires more than just standard maintenance, e.g. installing extra underwater components such as a stern thruster or stabilisation system. You may also need supplementary technical equipment in the engine room, such as an inverter or a generator, or the latest navigation instruments at the helmsman’s position. 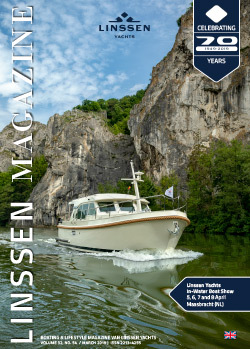 And despite the fact that your Linssen has a timeless quality, it may be the case that after 10 or 15 years of pleasant sailing, your boat may be somewhat dated with regard to electronics and interior styling. In this case too Linssen Yachts Services will be happy to adjust the interior or replaced outdated equipment. We of course hope that it never happens, but should you suffer any damage, you and your insurance expert will want that damage repaired so that it is invisible. We have in-house expertise to determine in detail the extent of the damage. In this way, you will never be faced by extra defects at a later stage and you can be sure that your boat will continue to retain its value. Professional subsequent fitting of stern thruster integrated into the hull. A Linssen 32 SL dating from 1986, provided with a new coating and a full interior restyling. The entire interior of this Linssen 442 SX dating from 1992 has been renewed. The panelling has been recoated, the soft furnishings and the carpet have been replaced, and the electronics on board have been updated, where necessary. An investment that gives a yacht a new lease of life. ALL SERVICING WORK WILL BE CARRIED OUT BY THE SAME PEOPLE WHO DEVOTED THEIR ENERGY AND CRAFTSMANSHIP TO BUILDING YOUR BOAT. WHATEVER REPAIR, ADDITION OR REFURBISHMENT IS INVOLVED, IT WILL REMAIN INVISIBLE AND, WHAT’S MORE, IT WILL BE JUST AS STRONG AND WILL HAVE THE SAME QUALITY AS THE ORIGINAL.